I remember feeling so confused coming in as a freshman. I had an idea of what I wanted to be doing but nothing else. I didn’t know about the amazing resources UNH had to offer or what else I should be doing to be successful here. I decided I wanted to be a mentor to help shine some light for others. I am most proud of the relationships I have made, with both students, facility and staff. The friends who I have made here, I know I will have forever. The connections I have made with the facility are ones I know will help me gown professionally and again, they will always be willing to help me. Linda Noon is my one of my favorite humans on this planet. For those who don’t know, Linda Noon is the RMP advisor and all around incredible person. Not only has Linda help set me up for success academically, she has also shown me everything UNH has to offer. She has supported everything I’ve wanted to do here. When I wanted to go aboard for two semesters, she figured out how to make it happen. When I changed my mind, she went right back to the drawing board to change my schedule. No matter what I do here, I know she will always have my back. She has been the most important person here at UNH for me and I am so lucky to have her in my life. UNH has given me so many opportunities to help me be successful. No matter what I want to do, UNH has the resources to help make that possible. As cheesy as it sounds, I know my dreams are not limited here. After graduation, I want to go into event planning. I want to work for a company and organize their outreach programs. I want to be able to represent a company I believe in while also be able to help change lives. My dream job is to be the First Lady of the United States. Not the president, but the First Lady, to have an influential platform to be able to bring change to the world. I have my cause and platform all planned out already, I am ready for anything. I am from Durham, NH so when it came to picking colleges, UNH was my last choice. I really wanted to escape my backyard. My middle school is on campus and my high school is right down the street. All of my field trips were to UNH to use their resources. I went to my senior prom with one of my professor’s sons. There were a lot of reasons why I was trying to go somewhere else other than UNH. I applied anyways, with no intentions of coming. I got in, but I had my heart set on a different school when my mom told me I had to come to UNH’s accepted students day to see what I was saying no to before I said no. I came and I sat down with the professors in my major, my advisor and heard from other students here and realized I couldn’t say no and fell in love with UNH. I fell in love with the community. People who are here want to be here. I like to think in high school musical when they say once a wildcat, always a wildcat stands true here as well. 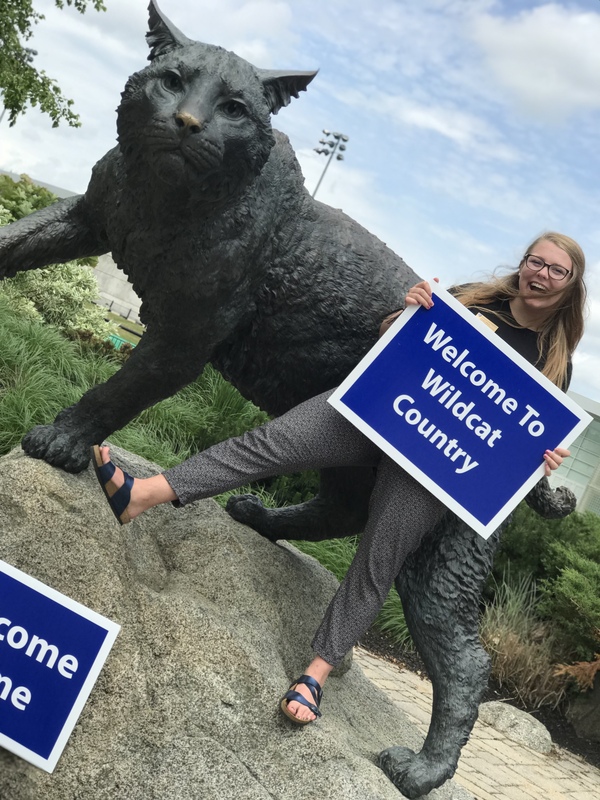 If you are at UNH, you are part of the wildcat family, and in this wildcat family, people look out for you, people go out of their way to make sure you are successful and happy. What I love about UNH is the sense of community and pride for being a wildcat.